Who is it for? Sugar Contour De Force Mini Blush Peach Pink For the Indian skin tones. 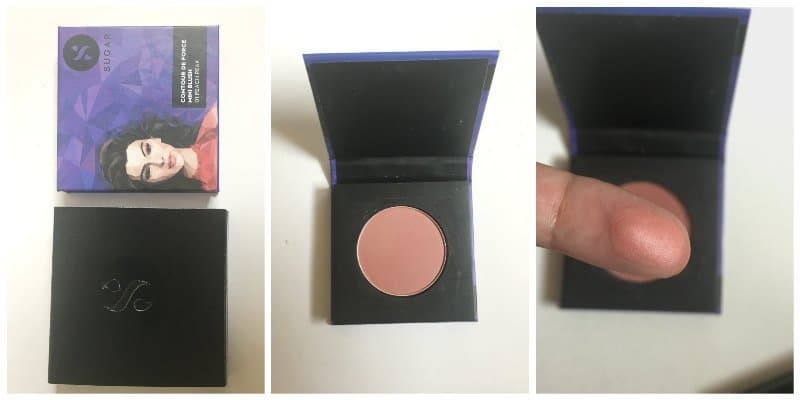 Women who like soft matte blush that looks natural would love this one. Apply after base makeup, on the apple of the cheeks as a blusher, with the blusher brush in soft swirling motions. No, but I have sensitive skin and it did not cause any irritation. It comes in a small but hard cardboard packaging which is purple in color with a quirky print of a woman on it. The cardboard box has a magnetic closure and has no mirror in the box. It is extremely lightweight and travel-friendly. The color Peach Pink is a pretty and natural looking shade that would suit Indian skin tones i.e, medium to fair skin tones. It does not contain any shimmer and settles on the cheeks to give a matte finish. The texture is quite smooth and satin-like, which can be easily blended. The texture isn’t like a loose powder and no excess product comes on the blusher brush. So even if one doesn’t flick the brush after taking the product, one cannot possibly overdo it. As it is not exactly powdery, no heaviness is felt on the skin and it wouldn’t possibly clog the pores. It has average pigmentation. The color is pretty light and doesn’t build-up even on multiple applications. Therefore, it is apt for natural looking make-up which doesn’t look overdone. It lasts as long as you don’t rub it off or remove your makeup. What did I not like about it? Yes, the color is natural and pretty for everyday use. Also, it is affordable. The pigmentation is average but that isn’t a con for me as I like to keep my blush on the lighter side. SUGAR Contour De Force Face Palette Subtle Summit 01- Why I Love it!